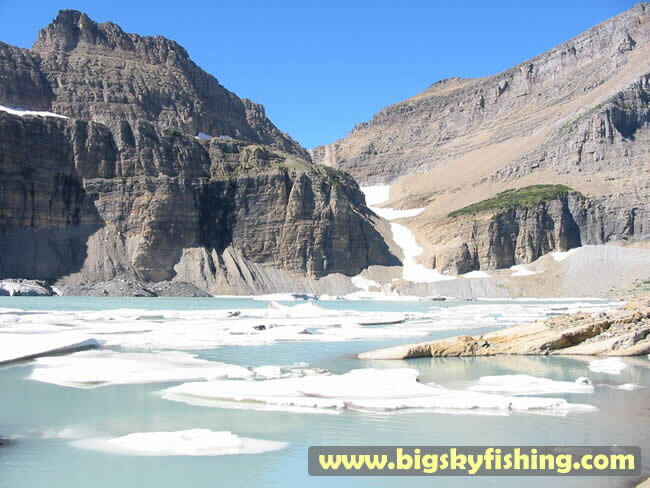 Similar to Iceberg Lake, Upper Grinnell Lake has ice floating around on it all year. This is due to the melting of the Grinnell Glacier. During the summer months, bits and pieces of the ice break off. Some of these pieces of ice can also be very sizable. The ice frequently takes weeks to fully melt, as the waters of Upper Grinnell Lake are exceptionally cold (just above freezing). The mountains in the background are part of the Continental Divide.